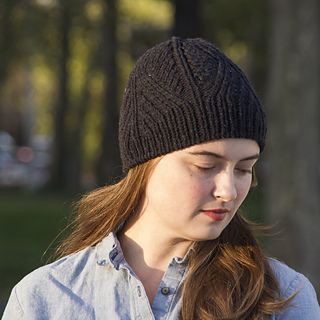 Divide is a richly textured unisex beanie worked in the round, featuring an architecturally inspired allover pattern of shifting parallel columns of ribbing and diagonal cables. Details like the tubular cast-on, seamless transitions from ribbing to cables, and hidden crown decreases yield a polished finished accessory with a stylish, ready-to-wear look. 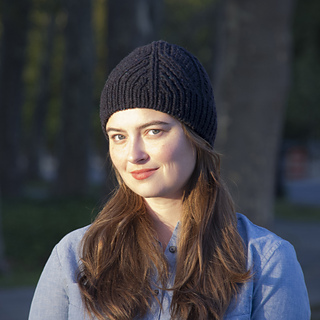 Version A is a modern beanie with a single brim, while Version B has a longer brim to be folded over and worn in the classic watch-cap style. 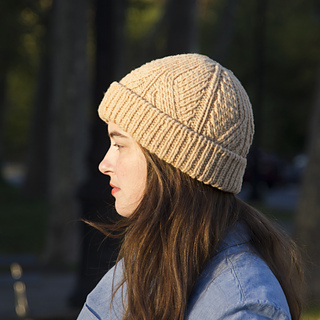 Worked in a pillowy, woolen-spun chunky yarn like Brooklyn Tweed’s Quarry, Divide works up quickly and is as satisfying to wear as it is to knit. 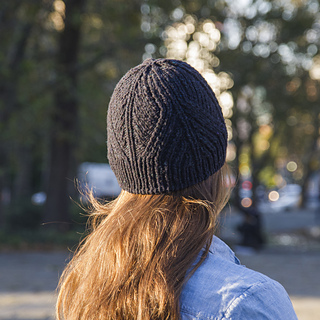 Recommended yarn is Brooklyn Tweed Quarry; samples shown in colors ‘Lazulite’ (Version A) and ‘Alabaster’ (Version B). Similar single-ply, woolen-spun, non-superwash wool yarns may be substituted. Please note, stockinette gauge is provided to aid in swatching for needle size selection only, as the pattern does not use stockinette stitch. 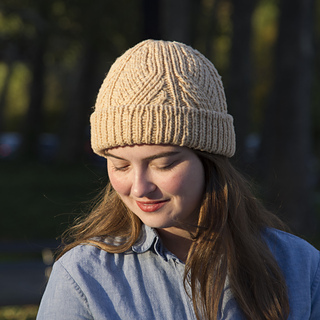 This pattern is written in one size; both versions measure 19 1/2” circumference, blocked and unstretched, to comfortably fit average adult head sizes 20-23”. Version A measures 8 ¼” in length, and Version B measures 8” in length with 2 3/8” brim folded up. 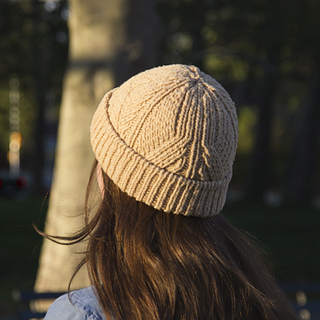 Intermediate: Skills required for this pattern include casting on, knitting in the round, knitting cables, and decreasing. Instructions are provided for optional special techniques including tubular cast-on and cabling without the use of a cable needle. 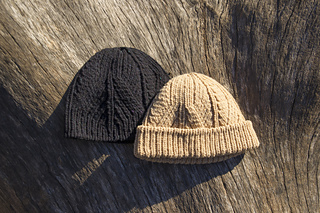 Cable pattern instructions are provided both in charted and written format using common knitting abbreviations.
. . . hats . . .